Using our patented technology, the Thermo Scientific NanoDrop 3300 Fluorospectrometer performs broad spectrum fluorescent analysis in a versatile, high-performance instrument. The NanoDrop™ 3300 significantly lowers the mass detection limit more than an order of magnitude, compared to conventional fluorometers. 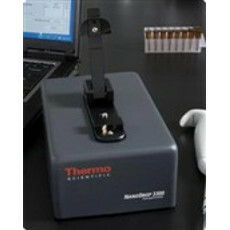 Find online auctions and classified ads for used Thermo Spectrometer products on LabX. Browse the ads below and contact the seller directly for pricing information.